I went to Africa for a summer to teach English and when I came home I hated eggs. Everything about them repulsed me—the jiggling soft piles of scrambled yellow curds, the taut cracked shell lying in the garbage can, the slimy glug of a raw yolk separating from its white. Just the plop and sizzle of an egg frying in a pan sent shivers of disgust through my body. This passionate dislike came upon me suddenly, vehemently, and lasted in some form or another for four years. Many thought it was odd; I had no bad egg experiences, no food poisoning or salmonella. I liked eggs just fine when I left for Namibia, but not when I came home. During my time in Africa I lived with a family in a small, poverty-stricken Namibian community. I spent my days teaching English and AIDS awareness to 6th graders and my evenings attempting to connect with my ‘host-mother’ Mbula, a woman of only twenty-three. The village was tucked away at the end of the Caprivi Strip, a thin piece of land jutting off the larger mass of Namibia straight into the heart of Africa and 8 hours away from the closest city. In a swirling mass of dust and heat, it was an unlikely society sprung of the Kalahari Desert. Dull brown sand covered every inch of the ground; gnarled shrubs emerged impossibly from the earth; small block houses interspersed with reed huts clustered along grainy roads and charred communal fire-pits. My skin sucked up the monotone color palette; even the sky felt brown. The gaps in Mbula and my value systems were profound and similarities few and far between. We did bond, however, over the domestic. Mbula, who had luminous black skin and was often decked in a bright green wrap-around skirt, was terrified I would never find a husband unless I could cook, clean, and sew like a true Namibian woman. She taught me to sew (I can still reattach buttons very well) and wash my clothes in their laundry bucket (launching into fits of giggles when the bar of soap continuously slipped from my hand and disappeared behind the submerged washboard). She showed me how to make shima, the potato-shaped patties of boiled maize meal, which we ate for every lunch and dinner along with gnarly sautéed greens and the occasional gristle of unidentified meat. And every morning at 5am, as the sun crept up in the lambent desert sky, Mbula and I stood together in the kitchen and fried eggs for breakfast before going to school. Each morning as I stood over the sizzling eggs, I tried to control my lurking but severe feelings of anxiety—an anxiety that I somehow managed to supplant into all eggs everywhere. Teaching was an exercise in control—control of the 40-odd children who piled in each of my classes and of the panic I felt knowing the little time and resources I had in my school. Between the ages of 7 and 15, my students were loveable and enthusiastic, scruffy and haphazardly dressed. They looked at me with wide, often confused eyes. My American accent made English, the country’s official language, sound as foreign as their local tribal dialects did to me. In addition, a silent haze of disease hovered over the village. Over half of the population was infected with HIV or AIDS, higher than any other Namibian town at the time. Wandering through the village on a Sunday morning, I watched men crawl out of the bars onto the sides of the streets before passing out, intoxicated by 10am; I passed lithe young women carrying sacks of grains, wrinkled grandfathers butchering raw meat in the market, and children kicking a soccer ball in the nearby sand-field. Statistically, every other person I encountered was infected. It was hardly ever spoken of; the stigma of AIDS was a constant challenge to broach. I felt always helpless, always overwhelmed. It was difficult to grow so close to my students and my host family and watch them stew in this culture of desperation; their lives so contained in a stagnant town. It was so easy to feel numb. And when I came home, ready for my junior year of college, I didn’t talk about it. I very soon moved to Italy to study art in Florence for a semester. I thought about Michelangelo and Fra Angelico, Provelone and Prosciutto, Chianti and Umbria. But I would not let myself think about my students—certainly not Mpunga, who always sat in the front row and wanted to be an astronaut; or Rose, a sweet seventeen-year-old girl who couldn’t stop giggling when we practiced how to use a condom on a banana in my Health Education club. I did not think about the other teachers there who were sick, possibly dying; or the way Mbula sometimes sat on the couch for hours at night, staring into space with no lights on. Instead, I developed a hatred for eggs. But over time, I’ve been able to talk about my experience in Namibia. I’ve gained some perspective and some understanding. And I'm happy to say that, in the last year, eggs have slowly come back into my life. First they were scrambled, with some toast. Then poached, on asparagus. Their texture ceased to disturb me and I could separate the whites from the yolk between my fingers without cringing. I may even, on occasion, have found the vivid yellow of a yolk to be quite pretty, really. And this weekend I made the ultimate break through. I fried an egg. (Two, in fact.) Then I ate them. And they weren’t half bad. Adrienne came over to my apartment on Friday after a long week of work, bearing the promise of weekend cheer and a bottle of wine. It was on the late end of things and I was tired; I didn’t want to cook something complicated or long winded. And so I was very happy to whip up two easy recipes from this past week’s New York Times: Garlicky Swiss Chard and Buttery Polenta with Parmesan and Olive Oil Fried Eggs. It shocked me that I had such a burning desire for a fried egg, the last vestige of my African egg-phobia, but I hadn’t been able to get the recipe out of my head since I had read it on Wednesday. It wasn’t the best thing I’ve ever made. I couldn’t find regular polenta in the grocery story near my apartment and so gambled with the (slightly grainy, mealy) instant variety. The swiss chard could have used a bit more time in the pan and the eggs, perhaps a little less. But that is beside the point. It is a comfy, warming meal, especially when eaten with a good friend on a chilly winter night. And I was happy, because as much fun as repressed emotions are when taken straight up, they are far more delicious fried in olive oil. There was a biting wind on Saturday morning as we walked up Fifth Avenue on the Upper East Side of Manhattan. My face was numb, eyes watering despite the wool hat and thick burgundy scarf wrapped around my neck. My mom and her boyfriend Charley were visiting for the weekend and when we decided to meander our way up to the Neue Galerie on foot, we had not bargained on the wind-tunnel created by the tree-lined expanse of Central Park to our left. I was in the process of fighting off a head-cold and spent a good deal of the walk distracted by the tickling of impending sneezes, failing at all attempts to wiggle the hunk of ice previously known as my nose. When we stepped into the Neue Galerie—a distinguished building on the corner of 86th and 5th—the toasty warmth immediately fogged up my glasses and I was blind on top of numb, wondering why I had ever wished for winter to come more quickly. But when my vision cleared and feeling beginning to re-enter my appendages, I found myself in a delightful little museum—soft light and wrought iron railings on the stone staircase. 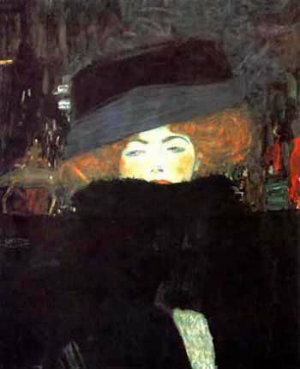 The Neue Galerie garnered attention recently when Ronald S. Lauder (ardent collector and son of cosmetics mogul Estee Lauder) paid a record sum ($135 million) to buy Gustav Klimt’s Portrait of Adele Bloch-Bauer I for the museum (his museum; he bought it in 1994). I had never been there before but have always loved Klimt’s work, and so in planning my mom and Charley’s visit, it was first on my (long, ambitious) list of places to go, amidst the (long, ambitious) list of art to see. 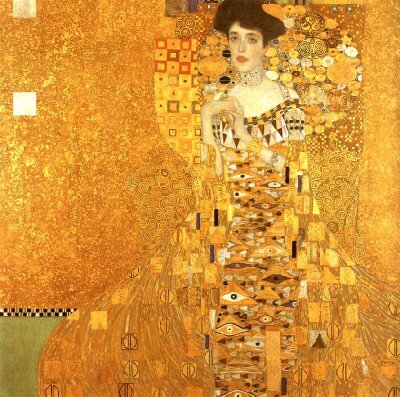 Klimt, a Viennese artist from the early 1900’s, is known for his many paintings and portraits of women – graceful, exotic women painted with both an elegant whimsy and romance – with elements of myth and classics, often eroticism. And Adele Bloch-Bauer is beautiful. I stood in front of the portrait, located in a small room with dark wood walls while people with audio guides clasped to their ears moved quietly around me. Her face is smooth and expressive; her hair is dark, eyes piercing. She is swathed in a long patterned gown, melting down the canvas studded in sparkling gold and colorful shapes. Standing there I suddenly remembered a postcard I used to have taped to the wall near the desk in my childhood bedroom. It was another Klimt image, one that I had not thought about in a long time. In Lady with Hat and Feather Boa a woman with flamboyant curly hair and pale skin gazes demurely out from under a black fur hat, a dark scarf wrapped around her neck. She looked to me like she was going somewhere; the tilt of her eyes implied she was perhaps hiding something. I liked that, I remember, because I often wanted to be going somewhere myself, wishing I had something to hide behind my own eyes. And so I taped her up on the wall; I liked to think that she was watching me. Lost in my thoughts, I jumped when my mom tapped me on the shoulder. “Sure,” I said. Wracking my brain for nearby restaurants, not very familiar with the restaurants in the ‘Museum Mile’ where we were; I was annoyed (and surprised) with myself that I had not already planned where we were going to eat. But then it came to me: the sound of clinking china as we had entered the museum, a warm food-smell (yes, I can smell cooking food from a distance! ), and something that had piqued my curiosity when I read a little while ago suddenly emerged from a forgotten recess in my brain. There is a place to eat right in the Neue Galerie – Café Sabarsky, a Viennese café right standing under our feet. We sat at a small, marble-topped table in the corner of the bright dining room. A piano stood off to the side, smartly-dressed waiters with white aprons tied around their wastes carried shiny trays holding steaming cups of coffee, a tall glass cabinet behind me held dark cakes and light strudels. “They have sausage!” said Charley with an almost boyish delight, looking at the menu in front of him. “This is so exciting. I love German-Austrian food like this; it’s the best!” He immediately launched into an impassioned attempt to persuade my mom to order a sausage dish as well… “so I can taste more than one!” he pleaded. She was not to be convinced, however. My mom’s family is from Denmark and she grew up loving foods and certain familiar tastes that are relatively foreign to me now. 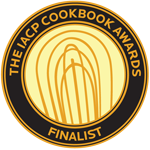 But for her, they immediately bring back memories of her father (whom I never met, but have heard much about his passion for the kitchen – a love of food is genetic, perhaps?). Pickled herring is one. It had been a while, but always a favorite flavor. After all, she told me in a confiding tone, when she lived in New York City in her late-twenties, she subsisted on only three food groups: pickled herring, cherry vanilla yogurt, and ring-dings. This confession left me shocked into momentary silence (not all food preferences are genetic, I hope?). But my mom let Charley enjoy his pale-white Bavarian sausage with potato salad on his own, while she ordered an open faced Matjes Herring sandwich with egg, apple, and topped with thin slices of red onion. “This reminds me of my father, too,” said Charley, gesturing at the unadorned sausages on his plate. My mom started giggling, raising her eyebrows. She's a psychoanalyst; Charley rolled his eyes. “Oh and what would your colleagues have to say about that?” he asked, laughing. I put my hands over my eyes and groaned, lamenting the sense of humor brought out with a bottle of lunch-time red wine and the insuing conversation about certain elements of Viennese cuisine. I concentrated on my food: a squash soup – thick and vibrantly orange, topped with the crunch of green toasted pumpkin seeds – and a beautiful salad with greens, cornichons and radishes, dressed with a pumpkinseed oil vinaigrette. Charley’s chestnut soup “Viennese Melange” with Armagnac prunes was rich and sweetly nutty. For dessert we had a Sachertorte and three forks. The sweet, dark chocolate cake with apricot confiture is a classic Viennese dessert and came with a puffy cloud of whipped cream. We left full, warm, and a little bit tipsy. It was the perfect state to be in on a beautiful weekend afternoon in New York. Art and food each have the ability to bring back such strong sensory memories; I love experiences when they combine. And after ours, we were ready to face the cold and continue on our artistic expedition.